In recent weeks, I've been flexing my culinary muscles more because it's a little challenging to find decent vegan grub in my neck of the woods. Sure, I could eat french fries everywhere I go, but...I've been trying to get back on the running wagon lately, and my body needs good fuel for my workouts. 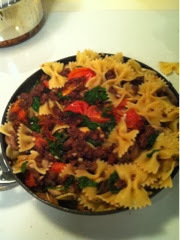 A couple weeks ago I decided to re-make a recipe I'd tried out earlier this year - Simple Vegan Italian Sausage and Pasta Dinner - from one of my favorite bloggers/cookbook authors - The Shannons. If you're not familiar with Dan and Annie, they're a husband and wife who set out on a culinary adventure to veganize Betty Crocker's cookbook. Which was no easy feat because Betty liked her butter, dairy, and eggs. I own their cookbook - Betty Goes Vegan - and I think it offers up some great recipes for people who miss meals they used to have in their pre-vegan days or for people who are trying to cut back on meat a little and aren't sure where to start. In a skillet/saucepan, heat the oil. Brown sausage in oil - be careful to not overcook. Add tomatoes, mushrooms, garlic, wine, and spices. Stir frequently until tomatoes and mushrooms begin to soften. Add spinach and basil and cook until leaves start to wilt. Slowly add pasta to sausage/tomato/mushroom/spinach mixture and stir to coat noodles with sauce. All told, this recipe came together in around a half hour. My boyfriend and I each has pretty substantial portions and he was able to eat the leftovers at lunch for most of the week. (I definitely used too many noodles) I really think the slight tweaks I made to the recipe (mainly adding more of each of the spices) really jazzed it up a bit. I'll definitely be making this recipe again!